There are few things more satisfying in the game of cricket than the realisation that a nascent talent has reached maturation. So it was then that on 23rd January 1984 Martin David Crowe shook off the shackles of expectation to achieve his first Test hundred. Crowe, who turns 50 today, went on to become his country’s greatest ever batsman; classically orthodox and seemingly with time to spare to unveil the full array of shots, his was a career blighted by injuries, though still one where he managed 77 Tests and 143 one day internationals between 1982 and 1995. The man known as Hogan to his compatriots, who made a recent comeback lasting just three deliveries at the age of 49, still retained that unmistakably stylish presence and stance at the crease, though given his body’s rather rickety service history perhaps it was a return that was always bound to end in tears. It was for the stamp of the very highest class that he brought to New Zealand’s cricket that he will always be remembered. Called up to a side that contained players such as Glenn Turner, Geoff Howarth, openers John Wright and Bruce Edgar and, of course, Richard Hadlee, the 19 year year old brought with him the baggage that only follows the very special: a schoolboy prodigy, here was a player who was not only expected to be great but who already looked great, too. While those around him fell into individualised batting stances; an exaggerated crouch here, a waft of the bat there, Crowe’s classical style was almost a throwback. His record aside, it may be for his fulfillment of the purists’ ideals that he is remembered so fondly. The Auckland born Crowe was first called up for New Zealand’s home series against the touring Australians in 1981-82. With Greg Chappell returning as captain and having beaten Pakistan at home and drawn with Lloyd’s West Indians, this was no mean test for the debutant. It also came just a year after the controversial under-arm incident in the 1980-81 World Series Cup. Chappell, if not then quite as unpopular in New Zealand as Douglas Jardine had been Down Under in 1932-3, was still the focal point for whatever animosity Kiwi supporters still felt over the incident. To his credit, Chappell proved conciliatory and sportsmanlike throughout despite being accidentally barged to the ground by a supporter at the conclusion of the first one day game in Auckland. This was still a strong Australia, though, with more than a whiff of the Packer years about it. The frail batting from the 1981 England trip had been bolstered by Chappell’s return as it had by that of Bruce Laird’s inclusion, too. Kim Hughes was firing on all cylinders and the bowling attack consisted of a firing Thomson, Alderman and a Lillee who was now the world’s leading Test wicket taker, spluttering along with whatever fuel remained in the tank. Though the series was drawn 1-1, Crowe had scraped together just 20 runs from 4 single digit innings. Coming in much lower down the order than he would perhaps have preferred, it had been a tough introduction. Things did not get much easier as he missed the Tests at home against Sri Lanka during the 1982-83 season. Following that, however, he did get the selectorial nod and received a tour berth for the 1983 World Cup and subsequent 4 Test series against England. New Zealand’s World Cup ended before the semi-final stage but Crowe still had time to leave an indelible mark on English audiences with his 97 at the Oval in the tournament’s opening game against England. Showing a composure beyond his then 20 years, he struck 8 boundaries, farmed the strike to protect a vulnerable tail and made the lion’s share of New Zealand’s 216. The Test series went England’s way, 3-1, although the Kiwis took the Headingley Test in what became known as Lance Cairns’ match. After a painful 29 ball duck in the opening Test at The Oval in mid-July, Bob Willis spectacularly removing his off stump, the young apprentice regrouped to reel off a series of cameos that would give a taste of what was to come in the years ahead, beginning with 33 in that Oval Test second innings. There followed 37 in the first innings at Headingley, where he dropped anchor to partner John Wright in setting New Zealand’s match winning total; a measured 46 in the second innings of the Lord’s Test and a 34 in the first innings at Trent Bridge. Though he hardly set scorecards alight, Crowe had made his impression. Summarising the series, Wisden wrote “The twenty-year-old Martin Crowe, while still getting the feel of Test cricket, did enough to show that he should be the bulwark of his country’s batting for years to come.” As the series concluded and New Zealand headed off home to prepare for the three Test series against the English tourists, Crowe’s fledgling career at Test level stood at 183 runs from 7 matches at an average of 15.25 with a best of 46.Having found his way, Crowe was clearly ready to raise his game. He would not have long to wait. The first Test at Wellington in January 1984 would be his date with destiny. New Zealand’s first innings 219 in that Wellington Test was below par given what was to come, Crowe himself having been clean bowled by Willis, as at The Oval in the previous summer, though this time for 13. England succeeded in making equally heavy weather of things until Randall joined Botham in a partnership of 232. In a match played in largely murky, overcast conditions, Botham played absolute havoc, hitting 22 fours and 2 sixes in his 138. Randall, more restrained initially, was no less effective, striking 20 fours and 2 sixes in his 164. As the tourists closed on 463 with a 244 run advantage it seemed that an innings victory was merely a matter of time. With both of New Zealand’s openers back in the hut with the score at 79-2 the 21 year old strode out to meet his captain, Geoff Howarth, in the middle. Exactly 200 runs later he departed the scene having made half of those runs himself. His maiden hundred was made from 247 balls and included 19 fours, an unusually high percentage. His main partnerships were with Howarth, 74, and a stand of 114 with the other centurion Jeremy Coney. Even in defence he looked assertive, creating an impression of impregnability that vindicated those who decided on his move up the order to number four. In 276 minutes he graduated from promising youngster to Test batsman. Wisden, not given to hyperbole, remarked “Martin, the younger of the Crowe brothers, showed exceptional maturity for a 21-year-old, without making a visible mistake until the stroke that got him out, an edge to slip that gave Gatting his first Test wicket.” It really had been that kind of innings. At a time when purists felt that the level of batsmanship had declined, and where the absence of technically proficient stylists was bemoaned by the likes of Ted Dexter and EM Wellings, the young Aucklander arrived to settle the argument in favour of classism and assuage the concerns of those who feared that it had withered and died. From that point he would go on, of course, to outstrip all his countrymen that had gone before him. The average would inevitably soar from the apprenticeship days of the first England tour, settling at 45.36 from his 77 Tests. In all he made 5444 runs, hit 17 hundreds and compiling 18 fifties. In the abbreviated format, his 4704 runs came from 143 matches with 4 hundreds and 34 half-centuries at a mean of 38.55. His overall first class average was 56.02, ranking him on a par with Boycott and above Vivian Richards. It is perhaps the measure of the man as a player that, at the age of 21, he filled the boots of the greatest batsman of the age, Viv Richards. The Antiguan, touring England with the West Indies, left a lacuna at Somerset that Sunil Gavaskar had also attempted to fill four years previously. Crowe, fresh from his recent investiture as New Zealand’s Crown Prince in Wellington the previous winter, seemed undaunted. In summer 1984 he compiled 1,870 first class runs for Somerset and was made one of the five Wisden Cricketers of The Year. As he reflected on his remarkable year in the southwest of England, he said with typical self-effacement “I probably learned more in six months than in six years before, and developed a greater awareness of everything that goes on in the middle. I seem to be able to understand the game more now. I’ve been prepared to accept everything that’s gone on, and analysed why things have happened, and I’ve now got a lot of answers that I probably didn’t have before”. Despite a poor start – having been on the wrong end of 5 consecutive single digit dismissals – he confounded any remaining doubters by striking 719 runs at 143.8 in the month of June. In a top flight career stretching over a decade, picking out the gems is in itself an exercise in subjectivity. There are, however, certain moments in Crowe’s career that can be said to serve as testament to his technique, classicism and elegance. His 106 at Lord’s on his second tour of England in 1986 moved David Frith to remark that it was like watching “a heavyweight Greg Chappell” – a likeness that is based on the soundness of technique and penchant for driving through the “V”. It was also, for English Test crowds, the first chance to see the finished product, the polished version of the boy that had arrived on their shores three years earlier. At the age of 22 in early 1985 he took on Marshall, Garner and Holding in Georgetown to make his maiden Test hundred against West Indies a big one, with 22 fours and a six in his 188. Statistically, his finest hour came at the end of January 1991 when he made the highest score by a New Zealander in Tests with 299 out of 671-4. In 1994, though, with injuries already threatening to curtail his career at the age of 31, he toured England for the fourth time and still hit 380 runs in the three Tests; the “old fashioned” 142 at Lord’s being his last great innings on English soil. However, perhaps the most memorable contribution from the late-era Crowe as a mature batsman and innovative, visionary leader came during the 1992 World Cup. Home advantage the Kiwis may have had but the captain maximised their effort to the full, often baffling opponents with successful experiments such as giving the new ball to off-spinner Dipak Patel. Sadly, injuries meant that he could not take the field in Pakistan’s innings during the semi-final as Javed and Inzamam carried their team home. Ultimately there would be no semi-final victory for the home town boy that day in Auckland. His own record during the tournament was phenomenal: in 9 innings he compiled 456 runs at 114 with a strike rate of 90.83. With a frame that was already beginning to wilt from serious injury, he took the attack to all opponents and ever more stylishly so. When he caressed a low attempted yorker from Curtley Ambrose for a perfectly executed on driven four, everything screamed “technical perfection”. The weight distribution, elbow position and follow through all bore the stamp of the classicist. 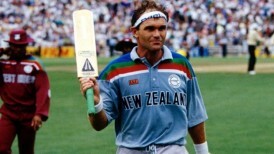 There were many such examples throughout World Cup 1992 as the bandana clad virtuoso in New Zealand grey became the leading batsman of the tournament. Then 29, it appeared at times as though he was auditioning on an imaginary New Zealand’s Got Batting Talent programme, so commanding, polished and stylish were his performances, so exaggeratedly perfect was his technique at times. His retirement, when it came in 1995, was not unexpected given his chronic knee condition and other ailments. It was, though, unquestionably sad. His departure from the scene has seen him become a keen advocate of a World Championship of Test cricket and also devise a now defunct short format which some saw as a precursor of Twenty/Twenty, Cricket Max. From my formative cricket watching years, however, Martin Crowe represented what a top batsman should actually look like. The fact that he could also play a bit was a bonus. When Ian Chappell, John Wright and Tony Greig sat round a Cricinfo table to discuss what makes a great batsman, all agreed that the look is vital. That look, they argued,though difficult to define,constituted command, elegance and the virtue of having time to spare. Looking good and boasting a high average were not mutually exclusive either, the trio felt. The usual names were bandied about, selected from the panel’s playing careers: Barry and Viv Richards, Greg Chappell, Graeme Pollock. Turning to John Wright, Ian Chappell remarked “What about Crowie?”. Hogan, no doubt, would have been justifiably proud to have been mentioned in such company, an ambition , perhaps, he harboured all those years ago as a precocious schoolboy in Auckland. There were many examples of his batting getting aesthetes a little hot under the collar, though maybe none were as fulfilling as that breakthrough century made in Wellington over 28 years ago.